I’ve been absent without excuse for just over five weeks—unprecedented in over eight years of climate blogging—and it feels like a lifetime. It is surely rude not to let readers know what I’m up to. My wife Ann and I are busy readying her late Aunt Rita’s property for sale. It is nearby and completely absorbing. In about another month or so, I’ll be free to spend some time on the Climate Conversation again. It’s delightful indeed that the conversation continues so well without me. Not because it demonstrates how unimportant I am (since it merely confirms what is redundant, in my view), but rather because it shows the leading role this website plays in an important modern topic. I’m proud to be associated with it and with you, and thank you for your loyalty. This is a vital moment in the development of our climate knowledge, with the release of AR5 and the associated ridiculosity, on the one hand, of the IPCC and its adherents scorning the honourable practice of science and the strengthening and multiplying voices, on the other hand, of their noble opposition. Yea, even unto the mainstream organs of news and knowledge like the BBC! Who might have thought it possible just a couple of short years ago that sceptical queries and objections could be expressed in conservative media? The power of your questioning, reasoning, rational speech and gentle persistence may be invincible. No rush RT. We’re waiting for the warming to resume anyway. Hope you’re not holding your breath. Actually we are waiting for Skeptical Science to produce their list of pre-canned responses to criticisms of AR5. I think the average guy has lost interest in this a long time ago. Even TVOne brought up “the pause” on the 6 O’Clock news this week, and featured sceptical blogger Andrew Montford. [lprent: andyS is now under moderation in this post for displaying the traits of being a credulous idiot trolling my post. There were more accusations of being an idiot, etc. The other was for the calculation that the additional heat in the oceans amounts to 0.065 degrees C since 1960. I provided that link too, which was at Lubos’ site and contained full workings. God help us if we get a Green/Labour govt if these guys are anything to go by. Last week when parts of the IPCC’s much heralded “Climate Change Report” were leaked to the press I, as much as any liberal, found myself despairing at some of its findings. No global warming for 16 years; record levels of sea ice; so many polar bears that the UN was proposing a humane cull to limit their numbers; no extreme weather conditions like hurricanes and typhoons – and – worst of all – the computer forecasts were wrong and there was no global warming! I felt like I did when as a child I found out that there was no Santa Claus! And in like fashion the scientists of the IPCC, when faced with the evidence of their own scientific research that Global Warming was the stuff of fairy tales, simply stood in a circle, held hands and chanted, “we do – we do – we do believe in Global Warming.” And miraculously, just like Tinkerbell, Global Warming was brought back to life. And thank goodness it was. Unless you are a Liberal or a Democrat you cannot begin to understand what it would mean to live life without Global Warming. It would be like a Christian being presented with undeniable evidence that there is no God – only worse! The genius of the IPCC is best encapsulated by statistics. 95% of papers written on global warming agree that not only is it happening it is manmade. The beauty of that statistic is that exactly 95% of papers written on Global Warming are written by those who have a genuine liberal conviction that it is happening – as well as a financial interest in perpetuating the splendid liberal myth of Global Warming. What I find astounding is that 5% of scientists persist in being climate change deniers – in spite of being cast into purgatory for daring to denounce it. Don’t those idiots realise that the correct answer is that not only is Global Warming happening it is manmade? Why do they insist on bucking the trend by carrying out objective experiments and coming to objective conclusions? It’s the same with journalists. If you want a busy career in journalism you’ve got to be on the winning team. Forget the facts! Stick to the propaganda! Climate change deniers like James Delingpole who approach the subject objectively and cast doubt on the IPCC’s conclusions deserve to be gagged – and his book “Watermelons” deserves to be burned in a modern “sauberung” action against the un-global warming spirit. If Delingpole had lived in Nazi Germany no doubt he’d have insisted, in his pathetically objective, fact-based, way, on writing articles claiming that Jews were not untermenschen – in spite of the fact that well over 95% of papers written by German scientists on the Jewish question agreed that the Jews were. Like German journalists who cast doubt on the scientific consensus that the Aryan race were superior to the rest Delingpole and other climate change denying journalists would have been shot! Yet we Global Warming liberals are still forced to suffer objective journalism which casts doubt on what we know to be true in spite of the evidence – that Global Warming is a clear and present danger! Was NZ’s warmest winter on record still too cold for you? Well, you will parrot other sites Andy. Like the IPCC. I was out skiing today, 23rd day this season. That is the problem in a nutshell. If I started burbling on about chemtrails and Agenda 21, they would rally around for a bit of sport. “we’re confident because we’re confident” – Professor Thomas Stocker, co-chair of WG1. In the latter and more probable case I think, Social Liberals’ individual liberties are being attacked by supposedly fellow Liberals whose “we’re right about everything and everyone else is wrong” attitude is anything but liberal. Once the component of individual liberty and responsibility is lost, there is no longer a liberal consensus and it’s anything-goes in pursuit of a social cause regime. The upshot being a federal system overseen by a supposedly Liberal Progressive but actually Communitarian President, shut down over the issue of social spending at a time when the country is head over heals in debt. Obama and the socialist/communitarian Left (liberal in name only) can’t afford to alienate too many real Liberals and Moderates or they risk splitting the Democrats, similar to what happened with the Republicans and the Tea Party. “we redistribute de facto the world’s wealth by climate policy” – Ottmar Edenhofer, UN. Figure 1.4 of the Second Order Draft clearly showed the discrepancy between models and observations, though IPCC’s covering text reported otherwise. I discussed this in a post leading up to the IPCC Report, citing Ross McKitrick’s article in National Post and Reiner Grundmann’s post at Klimazweiberl. Needless to say, this diagram did not survive. Instead, IPCC replaced the damning (but accurate) diagram with a new diagram in which the inconsistency has been disappeared. Flatus: The IPCC’s credibility is acknowledged by anybody with a brain between their ears. You however, and the sick hydra of right wing nutcases you represent here, will never accept this, because you can’t. Its against the paradigm you live by. Thing is, Figure 1.4 is a graph of CMIP3. It is the state-of-the-art, narrower margins, CMIP5 that’s relevant now. Someone at CA points to a (possibly) contradictory graph in Chapter 11, I think it is. Also questions now over the hindcast prior to the zeroing point. In any event, observed temperatures can stay flat for another 15 years or so and still be within the new Figure 1.4 margin. Some catastrophe using CMIP3. Flattie, were IPCC the most corrupt, incompetent and criminal organisation on Earth, the physics driving climate change would not be altered in the slightest. How can letting a geologist appear as a legitimate climate scientist to ridicule the IPCC report be in the public interest? Really? I wish I had more time for this and I wish Renowden would let me in. But then, I feel nauseous when I venture over there, so Gareth is doing me a favour by keeping the door shut. Some of the stuff Dave is saying is reasonable, like “no one at the IPCC is claiming uncontrollable warming”. However, he was defending the IPCC 2035 Himalayan melting date as a “typo”. I wonder which “values” at the BBC they are referring to? Perhaps the ones that allowed it to be infiltrated by Green activists, or the ones that allowed a culture of child abuse to continue for decades? Greenpeace protesters interrupted the Champions League match between Basel and Schalke 04 when they dropped down on ropes from the stadium roof and unfurled a banner protesting against tournament sponsors Gazprom. The game in Basel, Switzerland, was halted for around five minutes Tuesday (local time) when four protesters wearing orange boiler suits and helmets descended slowly on ropes which they had dropped from the roof after a few minutes of play. The banners said “Gazprom, don’t foul the Arctic” and “Free the Arctic 30” and had Greenpeace written at the bottom. The protesters then hauled themselves back onto the roof while officials watched from the touchline and the match continued. Thanks for the link. I have no idea who LPRENT is but they did a good potted summary of AR5. I note that Andy’s argument was not with the article itself but with an interview he heard on the BBC. I provided various links from the IPCC and I was called a credulous idiot for doing so. I have no time for the parasitic vermin that hover around The Standard and Hot Topic. Lprent is Lynn Prentice who s the founder of The Standard and the worlds greatest sysop. Apparently he k is everything about climate science and anyone who disagrees with any aspect whatsoever of the IPCC worldview is a credulous idiot who wil be permanently banned from Tne Boice of The Labour Movement without hesitation. Unfortunately for the cretinous Prentice, he didn’t know that the IPCC central estimate for ECS used to np e three degrees, he didn’t know It had been dropped in AR5 SPM despite the fact he just reviewed it, and he didn’t think temperature was a relevant metric when discussing global warming, despite the fac tthat every single discussion about Gil al warming talks about temperature. He also, in a previous encounter, claimed that GWP for methane was 72 when the official figure is 21. I will repeat this again, for the hard of hearing. I have nothing but undiliuted contempt for these people. RichardT. as one who has participated in organizing the estate for what we in the USA call Estate Sales both for relatives and strangers, and who has worked many estate sales as a negotiator with potential buyers I will embolden myself to offer you some advice. Your Aunt Rita is a nonagenarian, apparently of some means if her estate has required so much of your time. At first glance some of the items involved may appear to be of little value but are actually of quite a large value. If you have any doubts consult the best available expert even if you have to pay for the advice. I also frequent estate sales as a buyer and collector. Even the “experts” who evaluate the items for sale frequently don’t know what they are doing. If I had the time and energy (I’m 71) to purchase and market the mistakes I could make a good living buying and selling. For example’ as I type these words I am looking at a signed artist proof of a Roger Tory Peterson print of one of his paintings. Roger Tory Peterson illustrated and wrote the original bird guide. The print is archive framed and matted. I know from the kind of research climate alarmists don’t do that I could easily sell it for $1500 (US). I paid $60 (US) for it. If I lived in New Zealand I would come and offer my assistance. Even without the intimate knowledge of New Zealand I possess of the American South I would probably be of help as would be my soul mate, the beloved Libby. I and I’m sure Libby, an expert herself, would advise you to reflect on what your Aunt great interests were when she was accumulating “stuff”. There frequently lies the real monetary value. Also, I have been checking in here daily looking for new posts. I suspected your absence had something to do with your Aunt’s death. I missed that the discussion was still going on without you. I pledge to participate in that discussion in the future. Was 15-23 yrs of no warming not enough for you? Everyone in Auckland that I’ve asked doesn’t seem to think this winter was the warmest they can remember (including those with greenie leanings), in fact they all seem to think it was bloody cold and the difference between this years electricity bill and last years via the heat pump agrees wholeheartedly – approximately twice the price. Maybe it was just the rest of the country that was so warm. It’s delightful indeed that the conversation continues so well without me. Yes, it has been a real hive of activity. Andy kicking metaphorical cans cans around in the dust and RC talking to himself. These Greenpeace activists are going to be used as an example to the rest of the warming alarmist movement that Russia is serious, from the way this is panning out there will be some activists that get the longer sentences, probably 8 – 10 years, these people will have been specially selected to send a message back to their country of origin, other Green sheep 3 – 5 years. The fate of the captain and the Arctic Sunrise is slightly less clear at this time, no charges have so far been brought against him, but if members of his crew are found guilty of piracy then the captain must also be a pirate, and the Arctic Sunrise a pirate ship. 10 Pages of IPCC Science Mistakes? Political manipulation of a scientific document – or pages upon pages of newly-discovered scientific errors? You decide. Completely untrue, on both counts.We’ve long known that the oceans take up heat associated with surface warming. The early energy balance papers (Steve Shcneider’s stuff from the late 70s, Hansen’s stuff from 1985, etc etc) make that very clear. In Levitus’s 2000 paper he puts numbers on the heat capacity of the system (effectively). Those are all very consistent with modern arguments about the energy balance. Who calls the shots around here? You’re both correct, just talking at cross-purposes. The GWP over 20 years of methane is 72. The GWP over 100 years of methane is 21. Incidentally, part of this “discussion” on The Standard had a certain commenter posting my full name (against moderation policy) and without my consent. By some undocumented (by the IPCC after 25 years of speculation) process too. So shouldn’t that be “Time to do something, [IPCC], I think…” ? Actually I’m inclined to agree. We can’t debate – or more importantly, critique the process – if there’s no observed (at the interface) air => sea heat transfer of the magnitude required to account for 1950s – 2000s ocean heat accumulation. Neither is there any paper positing the thermodynamic process at the air/sea interface, whether radiative or sensible heat (the IPCC don’t elaborate, see below). Is that statement even debatable? Thomas Stocker and Qin Dahe are the Co-Chairs of Working Group I. So the work of all the lead and contributing authors of the respective nine chapters will be overridden by Stocker and Dahe’s changes. Will the author lists of each chapter reflect this and the changes flagged in the text as revision? I bet not. The warming in the attribution period actually started 1979, not 1951 i.e. the chapter authors got it right first time. But the summary attribution period of “warming” is 1951 to 2010 even though only 2 of those 6 decades exhibited warming. Got to get the meme right. So where next for the IPCC? Looks like the pause is over but no sign of warming resuming. In fact, a bit of cooling. Given their bumbling efforts to explain the pause, this next episode should be a doozy. Thomas Lovejoy is professor of science and public policy at George Mason University and biodiversity chairman at the H. John Heinz III Center for Science, Economics and the Environment. The current 11-year peak in solar action is the weakest seen for a long time, and it may presage a lengthy quiet period. Previously, historical records suggest that such periods have been accompanied by chilly conditions on Earth – perhaps to the point where a coming minimum might counteract or even render irrelevant humanity’s carbon emissions. The “Little Ice Age” seen from the 15th to the 19th centuries is often mentioned in this context. And yet the Little Ice Age appears to have affected the climate powerfully. IPCC-leaning scientists, however, say that the Little Ice Age couldn’t have been caused by solar variability – not even solar variability combined with sky-darkening volcanic eruptions – as the effects would have been too weak. Co-author Thomas Stocker is also co-chair of IPCC AR5 WGI. Stan, your willingness to give expert help warms my heart. But things are going well and we lack for nothing to do the job. Thanks for your participation. Yes, they need to take it from further back so they can try to say that it’s a trend of at least a 30 yr period. Whereas the ‘pause’ only lasts from 16-23 yrs in length and is insignificant due to it being less than 30 yrs. If we say there has been no warming for 18 yrs (an average of all the temperature records) then that gives us approximately 15 yrs of warming followed by 18 yrs of no warming, which is a pretty crap track record for AGW theory. The IPCC are going to expire from their next report, they have no scientific integrity left, and it’s so obvious I doubt even the greenies and their propaganda mouthpieces in the media believe it anymore. With regard subjective perceptions of last winter, in the north several aquaintances have commented on it being a long cold winter with a warm patch in the middle. Keri Keri recorded its lowest night time temperature since records started. The ploy here is to talk in GT’s so that the audience cannot relate to the familiar and far more useful measure of parts per million. By taking this approach the obvious divergence between atmospheric CO2 ppm tends and actual temperature trends can be avoided. Taking their last number 48 GT CO2 (13GTC). The annual increase in atmospheric CO2 on the current trend line is about 4GTC pa. Extrapolating the current trend means that CO2 would be about 460 ppm in 30 years. The annual usage of fossil fuels averaged about 8GTC pa over the last ten years. Their total post industrial budget number is 1000GTC (3670 GT CO2) above. The current total CO2 in the atmosphere is around 852 GTC (400ppm), and the pre industrial level was around 600GTC (280ppm). It will reach 1133GTC (460ppm) in thirty years on current extrapolation. Ignoring that in thirty years we will will have only used half their post industrial budget, the whole measure is a load of nonsense. But we can presumably infer that IPCC are now saying that with another 30 years of status quo, which would take us to 460ppm, will see the tipping point beyond which disaster happens. If that is there position they should state it in terms we can understand – and all have a good laugh. How can they put probability values on any of these acenarios? Christchurch’s traumatic recent history has prepared it more than most for the rigours of risk assessment and disaster planning. The Council is expecting climate change to deliver a 50-80 centimetre rise in sea level, a temperature increase of two degrees and changes in rainfall and extreme weather events. Why are they rebuilding Christchurch if they are expecting a 50-80cm rise in sea level? A significant part of the city would be affected. Why does Auckland think that temps are “likely” to rise between 0.2°C and 2.5°C by 2040 and Christchurch by 2 degrees? Do these guys actually think at all when writing this drivel? Auckland Council has set a target to achieve a 40 per cent reduction in greenhouse gas emissions by 2040, based on 1990 levels. Wonderful, and starry-eyed. Meanwhile in the rest of the export-driven country, dairy, logs, fruit, steel, and what have you logistics are wholly dependent on fossil-fueled trucking, shipping, and rail (except for a bit of electrified NIMT). I suspect that just the fruit export sector alone easily generates more CO2 emissions (which occur globally) and uses more CO2 industrially than all the NZ cities combined. None of which however, are anything near comparable to natural emissions anyway or are capable of any climate effect even regionally. JC comments: Well I had a tough time deciding what NOT to include in my excerpts, since all of this is music to my ears. Kudos to the National Taiwan University for hosting this workshop; dare I hope that this topic will be trending for workshops in the U.S. and Europe? I regard this as THE key unknown, and I would not be surprised if it were significantly higher than 10%. More of this kind of ‘outside that box’ thinking, please. Down to earth for sure. Eight succinct and powerful paragraphs that every politician should read. It’s not as if it would be time consuming – like an IPCC Summary For Policymakers for example. In a bumbling, obtuse kind of way, climate science is inching towards the alternative explanations anyway, with a little help from the climate lately. But in doing so the IPCC’s internal inconsistencies are exposed. Already AR5 is out of date and there’s some rapid progress lately (although the IPCC wont be trumpeting it) on natural variability; the one major item that is creating the inconsistency along with erroneous estimations of external forcing. So not only is pressure on the IPCC coming from considerable understanding outside climate science, now it’s coming from understanding within too. And yes, there’s not really much need to resort to any other avenues although that’s just a natural progression for more inquiring minds I think. The extreme weather meme hasn’t gained traction with the IPCC but they do appear to be tentatively adopting ocean heat as some sort of contingency. Speculation only so it’ll be interesting to see if they go on with it. I saw at the link below where a ∆E of 20 x 10E22 J (the estimated ocean warming) equates to approximately two hundredths of one percent of estimated total ocean heat. The IPCC can’t keep dining out on their 20th C warming attribution forever if the 21st is not following suit i.e. Lindzen’s a) and b) consistency isn’t that much of an issue IMV because either way, whether human attribution or not, the alarm bells can stop ringing. Scientists have calculated dates when they say temperatures for cities around the world will be permanently above historical extremes, and for Wellington that year could be 2041. The study did not look at any other places in New Zealand, but did do the calculations for several Australian cities, as well as many other centres around the world. For Sydney the date could be as early as 2038, for Melbourne it could be 2045, and for Perth and Brisbane 2042. And all I can see out of my window today is snow in them thar hills. Lots of it. Thomas Stocker of WG1 is in Wellington, for a stakeholder conference. Why is this man in NZ? “An old rule says that climate-relevant trends should not be calculated for periods less than around 30 years,” said Thomas Stocker, co-chair of the group that wrote the report. Many scientists say the purported slowdown reflects random climate fluctuations and an unusually hot year, 1998, picked as a starting point for charting temperatures. Another leading hypothesis is that heat is settling temporarily in the oceans, but that wasn’t included in the summary. Not very impressive. Actually, pathetic. Since the data requires a low climate sensitivity and since alarmism requires a large climate sensitivity, the “likely range” of climate sensitivity will remain large until the global warming scare will abate. very well put, a good argument. Thanks for the link Andy. On another topic (yet on topic regards this post), it seems Climate Conversations is now a red dwarf, due to RT’s diminishing involvement, for good reasons.. I have some transformation ideas, but first I seek agreement that RT, having done a marvelous job over the last 6 or 7 years, needs to either shut down the site (because his work is largely done – alarmists are sooo last century) or transform into the next incarnation. I appreciate a community such as this. Any thoughts? My question: why is he smiling? Re CCG Mike, I think we’re entering an entertaining phase of climate alarmism so a venue like this to enjoy it is much appreciated. Put another way, can anything beat this? “Unprecedentedly, I had direct access to the meteorologists concerned, as I was in Exeter in spirit form, and I managed to speak to the principal actors. Questions : Vincent Gray. “There has been no warming for 15 years. Surely this means that the models are wrong”. By not showing all the data, and instead, only that which best supports the narrative the IPCC wishes to spin—that climate models are reliable tools for projecting future climate changes resulting from human emissions of greenhouse gases—the IPCC misleads the public, government entities that defer to the IPCC (such as the EPA and the Supreme Court), and policymakers. This has got to stop. The IPCC has outlived whatever usefulness it may ever have had. It is time to disband this central climate “authority” and disperse the assessment of climate science to a broader, more diverse community. I missed Vincent Gray’s question – what was the answer? Stocker did say that “the pause” was a topic of much research, and Dave Frame worked on the chapter on “the pause”. Brilliant – laugh! Had to read it out loud to my wife.. They have wrapped it up now. Peter Barrett (?) at the end describes the work of the IPCC as one of the greatest intellectual achievements of mankind. Which is correct, the satellite data or the SEAFRAME data? The blogpost, published this week on the Polish site for November’s Warsaw meeting, said that not only would melting ice allow ships to cut their journey times by taking the north-west passage, but “we may also build new drilling platforms and retrieve natural resources hidden below the sea bed”. For the time being we decided to take some time away from our blog. Our idea was to focus attention on important issues that need good solutions and spark discussions on those. We did not foresee that some readers would take thepresented texts literally as the official Polish position. Notwithstanding we would like to express regret as some of you found the text to be inappropriate. We acknowledge these criticisms. It was certainly not our aim to offend anybody. We will take due care that all new articles and posts on this website are written in a clear and sensitive manner so as to avoid misunderstandings. Stay tuned for more ideas. Yes, group hug was exactly the thought that went through my mind. Tim Naish also hauled out the old Hockey Stick complete with temp record spliced onto the paleo data. It was just a great nostalgic moment, sort of “The Best of the IPCC – The boxed set”. Magoo, 7.9a on pg 125 (3rd link) does show (by eye) the shorter satellite trend to be much steeper than the 4 non-SEAFRAME tide guages, even over the common period. Also it would appear that 1993 was an unfortunate start date for both the Majuro SEAFRAME tide guage and the satellites going by that graph. ● A SEAFRAME gauge was installed in Majuro, Marshall Islands, in May 1993. It records sea level, air and water temperature, atmospheric pressure, wind speed and direction. It is one of an array designed to monitor changes in sea level and climate in the Pacific. ● The sea level trend to date is +4.3 mm/year but the magnitude of the trend continues to vary widely from month to month as the data set grows. Accounting for the precise levelling results and inverted barometric pressure effect, the trend is +3.8 mm/year. Nearby gauges, with longer records but less precision and datum control, show trends of +2.3, +1.3, and +1.7 mm/year. The sea-level rise near the Marshall Islands measured by satellite altimeters (Figure 7.5) since 1993 is about 0.3 inches (7 mm) per year, more than the global average of 0.125 ± 0.015 inches (3.2 ± 0.4 mm) per year. 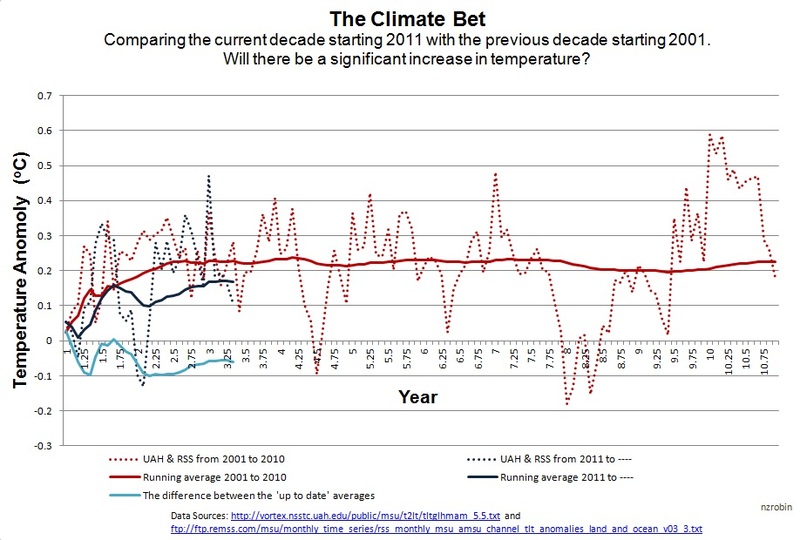 This rise is partly linked to a pattern related to climate variability from year to year and decade to decade (Figure 7.9). 7.9a is 4 tide guages (not SEAFRAME) going back to 1950. Pg 2 summary is a SEAFRAME gauge installed in Majuro, Marshall Islands, in 1993 and the trend “continues to vary widely from month to month as the data set grows”. 7.6.6 is satellite altimeter “near” [not “at” note] Marshall Islands since 1993. In the tropical west Pacific a 7 mm per year trend is not unusual in either tide guages or satellites so neither is correct or wrong i.e. you don’t have to move very far from a specific location to obtain an entirely different trend. However, given the work (precision and datum control) that has gone into the SEAFRAME array then they will be reliable for each specific SEAFRAME location. The satellites are calibrated with surface but not necessarily with Majuro for example. No SLR trend (in fact a fall over vast areas) in the eastern tropical Pacific for the last 21 years i.e. SLR is NOT a global phenomenon. The global metric is skewed by the western tropical Pacific west of Marshall Islands. Wow, you’re on the money, Mike! Impressive. I thought this morning that your comments are without doubt perspicacious, for my intention is and has been for some time to produce a forum to range over all human affairs. I’ll start a thread for it. Perhaps “A Conversational Climate”? Or “Climate of Conversation”? Here is actual live footage of the Sean Thomas and Stephen Belcher meeting. Note the overwhelming evidence for global warming in the background in the form of hellfire smoke, although it might be the computers overheating from the climate models malfunctioning. One hopes that the “Climate of Conversation” on this side of the Tasman remains free of that brand of sordidness. Either that or the forum doesn’t quite range over ALL human affairs perhaps. On the other hand, but unfortunately, maybe that’s exactly the type of topic on which to converse? The IPCC need to dump their PR consultants and get this guy. Excellent! I like either title. I like the thought that we can start to discuss the many other aspects of this marvelous planet and the people thereon. Although weather and climate are fascinating, and have fascinated many of us for many years, there are lots of interesting things to converse about. The Fukushima incident, the future of global finances, imperialism and war, people smuggling, history of the Middle East…. I might go on, but I’m sure others have plenty of other interesting topics they might like to list…? It’s always been interesting Andy. Not detracting from it at all, but my attitude to the debate is simply that they’ve had 30 years to convince the world of impending doom, and have clearly failed to do so. Why? Because the evidence is not strong, to be charitable. So now it’s time to focus on things that actually matter in the world, and tell the warmists to talk to the hand. The hard-core warmist will never be swayed from his zealotry, so debate with him is futile. Absolutely futile. If it has been cooling for 100 years, he will not be swayed. Anyway, I’m off to mow the lawn – bloody thing has started growing like crazy. Must be all that plant fertiliser floating about. Despite no warming for 15 years, there still seems to be a sense of massive urgency that we need do “do something” to reduce emissions. I was watching the IPCC live stream on Friday from the RSNZ and I got no sense that alarm had diminished. There was talk of tipping points, the IPCC being too conservative, etc etc. So, the question is much bigger than climate, or weather. It is how do we deal with this modern disease that sees humanity as the enemy of the planet, a form of “disease”. I personally feel optimistic that human ingenuity can rise to any challenge, but this is not the message we get in our education and political systems. The elephant in their room.